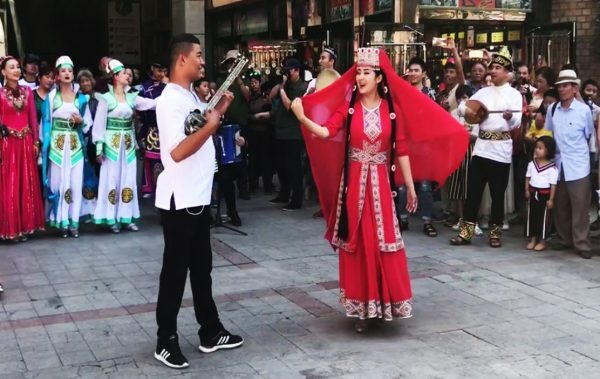 The Uyghur people are renowned throughout China for their excellent dancing skills, particularly in reference to a type of performance art known as the Twelve Muqam. This classical epic is comprised of 340 folk songs and dances that are separated into twelve parts called Rak, Čäbbiyat, Segah, Čahargah, Pänjigah, Özhal, Äjäm, Uššaq, Bayat, Nava, Mušavräk, and Iraq. If you were to play them all back-to-back in full, it would take an average of 24 hours to complete! In 2005, UNESCO designated this incredible folk art as an Intangible Cultural Heritage of Humanity. Historically speaking, the precursor to the muqam was a type of music called the “Great Western Region Melody”, which originated from Central Asia and appeared in China during the Han Dynasty (206 BC–220 AD). It became particularly popular during the Tang Dynasty (618-907), when it was developed as an art form and greatly enjoyed at court. The Uyghur people masterminded several local muqam systems and named them after oasis towns in Xinjiang, including Dolan, Ili, Kumul, and Turpan. Many of these regional varieties of muqam still exist and are widely popular today. However, arguably the most magnificent of these systems is the Twelve Muqam. They represent a body of folk art and dance that was edited and systemised during the 1950s by celebrated performers such as Turdi Akhun and Omar Akhun. Although the Twelve Muqam are grouped together, they each differ in musical style, dance choreography, and type of instruments used. Some are performed solo, while others are group pieces. Each muqam begins with a long free rhythm introduction, which is followed by characteristic rhythmic patterns that gradually increase in speed. The overall structure can be separated into three parts: the naghma, the dastan, and the mashrap. This can be further subdivided into smaller pieces known as täzä, nuskha, small säliqä, jula, sänäm, large säliqä, päshru, and täkit. 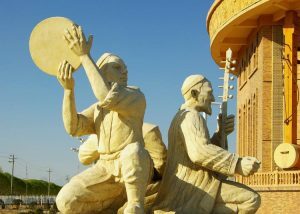 The content of the pieces ranges from folk ballads right through to poems written by classical Uyghur poets, giving a broad spectrum of Uyghur history and culture. In-keeping with this local aesthetic, many of the dance moves are based on everyday tasks or scenes, such as flower picking, carrying the bowl on the head, and imitation of various animals. When it comes to musical accompaniment, there are over 62 types of instrument used by the Uyghur people, including a type of long-necked lute called the dutar, a sheep skin tambourine with small iron rings attached to the rim known as the dap, and a smaller stringed instrument called a rawap. The Twelve Muqam are commonly performed at a traditional type of Uyghur gathering known as a meshrep. This is an all-male event that is held within the courtyard of a participant’s family home. Traditionally they were only held on special occasions, such as the harvest, wedding days, and coming-of-age ceremonies. Each meshrep consists of a leader, who is typically the elder, a disciplinarian, and a group of 30 or so younger men. They all sit on a carpet together in sequence according to seniority. The women and children of the host’s family are not permitted to join in, and are instead relegated to the task of serving the guests food. Talk about getting the raw end of the deal! Meshreps are primarily male bonding events, where the men will play muqam melodies, perform whirling circular dances, sing songs, act out comedic skits, and recite lectures from religious leaders. However, there is a darker side to this noble pastime. A substantial portion of the meshrep is sometimes dedicated to scolding the attendees for their moral transgressions, such as the drinking of alcohol or the taking of a second wife. Generally speaking, however, the meshrep is a time for entertainment and, in some parts of Xinjiang, they can last the whole night! On other special occasions, such as weddings, parties, or festivals, the Sanam Dance is usually performed. This popular folk dance has a lively musical accompaniment and is characterised by an increase of pace, starting slowly and gradually becoming faster. The style of dance varies from region to region, and dancers may even improvise in the midst of the festivities. After all, it never hurts to get a little lost in the music!